Anne-Marie Traynor has accumulated a wealth of experience over the 23 years that she has been managing volunteers at Calvary Kogarah. So much so that Anne-Marie was recently awarded for her outstanding professional contribution to the field of volunteer management in palliative care by her peers. 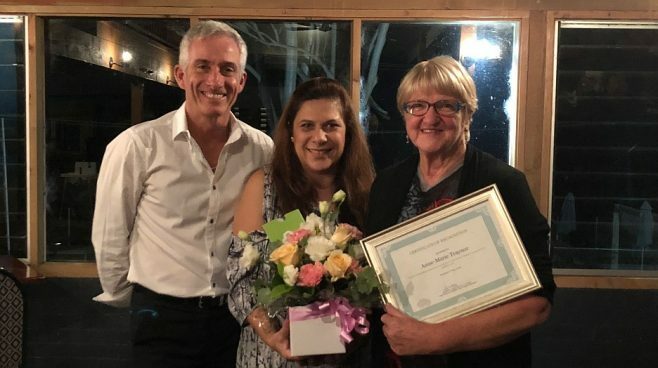 Her award was presented at the recent Palliative Care Volunteer Manager's Conference in Coolangatta Estate by the Convenor of the Network of Managers of Palliative Care Volunteer Services, Jacquie Martinez. As Manager of Volunteers Anne-Marie has oversight of all volunteers at Calvary Kogarah Hospital, including palliative care volunteers within the hospital and in community visiting roles. Community visiting volunteers attached to her service are active not only at home but in supporting people in residential aged care. In all there are about 120 volunteers across the various activities. Anne-Marie said that she was honoured to receive the award. "I really believe that the contribution our volunteers make to the lives of patients and families is significant and meaningful." "I've always been really grateful for the support of my peers, so a big thank you to everyone who has offered their help along the way." The Network of Managers of Palliative Care Volunteer Services aims to ensure best practice for managers of palliative care volunteer services and to provide support for members of the Network. Membership is open to any and all managers of palliative care volunteers, meetings take place quarterly (for meeting dates see Events page) by teleconference and at venues within NSW. Pic: Anne-Marie Traynor in centre with Jacquie Martinez and Alex Huntir from Palliative Care NSW.